Why Does Soda Taste Significantly Better When Carbonated vs. Flat? 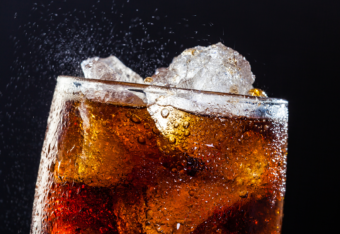 Tyler K. asks: Why does soda taste worse when it’s flat? So why do many fizzy drinks taste better than their flat equivalents? It’s simply because the carbonic acid (H2CO3) created via adding carbon dioxide (C02) to the drink (which obviously in turn contains H20) actually has a tangible taste that your tongue can detect and which accents the flavor of the beverage. Thus, as these beverages are designed to taste good in their carbonated form, removing the flavor imparted by the CO2 is usually going to negatively impact taste. Of course, this doesn’t inherently mean a worse overall flavor for any liquid that is not carbonated vs. the same drink that is. But because many carbonated beverages like popular sodas tend to have a lot of sugar or equivalent artificial sweetener, when the CO2 is removed, the extreme sweet flavor ends up standing out quite a bit more- usually more than most people enjoy. The net result of all of this is many people not enjoying the taste of “flat” sodas. On a related note, to narrow down the mechanisms behind the taste derived from carbonating beverages, researchers in 2009 used mice that had been genetically modified to not be able to taste variously- sweet, umami, salty, bitter and sour. What they found was that those mice that could not taste sour did not react to carbonation, while all the others did. While manufacturers put the same amount of CO2 in cans as bottles of soda, when placed in plastic, which is more permeable to CO2, the carbonation will dissipate relatively quickly over time. In fact, if stored in direct sunlight, in 3 months, soda in plastic can lose up to 15% of its carbonation. Cans of soda, on the other hand, can have their taste affected by bits of metal that are dissolved from the inner lining, and again, the warmer the container, the greater the effect. This is one of the reasons many people have preferences when drinking soda from glass vs. plastic vs. metal containers. Four of the five tastes were known to the ancient Greeks, with Democritus (460-370 BCE), who together with his teacher Leucippus had formulated the first atomic theory of the universe, adding bitter to sweet, salty and sour. Applying his ideas on atoms to the tastes (he thought different atoms had different shapes and solidity), Democritus opined that for sweet things, their atoms were large and round, salty flavors had an isosceles triangle shaped atoms, sour flavors were also large, but rough and angular and bitter tastes had smooth, small and spherical atoms. The famous chef Auguste Escoffier (1846-1935) introduced the idea of a fifth taste to European pallets with his invention of a rich, delicious, never-before seen veal stock that simply seemed to deepen and improve the flavor of everything. At the time, however, scientists refused to acknowledge that the stock embodied a taste separate from sour, sweet, salty and bitter. Kikunae Ikeda (1864-1936), a chemist, actually isolated the source of the “deliciousness” flavor of some foods (including Escoffier’s veal stock) that seemed to defy the other categories – glutamic acid, which he named umami. What happens when you combine H2O and CO2? Well, that explains that! A sliver in the thumb of my life mystery explained! It also helps frame the reason I find carbonation in pop essential, but absolutely cannot stomach carbonated soda waters. I think flat Coke taste has a very earthy taste, definitely worse than when it’s carbonated. Is the sour taste also the reason why carbonated water quenches thirst so much better than flat water or is that a preference thing? Doesn’t that indicate that bubbles account for the difference? The original flavor, not the flavor when flat. Essentially, a freshly opened can in that pressurized environment and in normal atmospheric pressure tastes the same. I always assumed that because the bubbles create ‘agitation’ in the liquid, it causes the same tastebuds to get bombarded repeatedly with a ‘flavour hit’ multiple times per second. In other words, as the bubbles cause the liquid to move around on a microscopic level, you’re never really letting an overly sweet or overly bitter flavour stick around for too long, before those taste buds are reset to ‘neutral’ briefly, ready for another dose of tastiness. All this happening over a reasonably long duration and over multiple areas of taste buds? Delicious! Your sense of smell has likely decreased Ronnie. No, its mainly due to the different sugar that is used. Ever seen an “Old fashioned” coke product at the store? They used to use pure sugar cane sugar to sweeten their drink, but now they use corn syrup, which tastes dramatically different. Its a cheaper alternative that costed them in flavor.